Today I entered my first paddle tennis tournament, because paddle tennis is totally awesome and it’s my new favorite sport by far. I like to think of it as tennis without all the schlepping. For those of you unfamiliar with paddle tennis, it’s about halfway between ping-pong and regular tennis, played on this ADORABLE court. We got destroyed in our first game, and since it was double elimination, our ten dollar entry fee allowed us to get destroyed in the second game, too. Still, it was awesome. 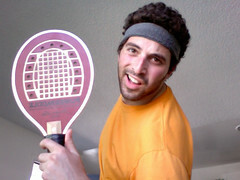 And this is a picture of me with my racquet. Everyone else uses these fancy graphite racquets or whatever, but since I’m cheap and into the classics, I go wooden. It feels like I’m Bjorn Borg playing against Roger Federer, without the skill sets, knowledge or understanding, and also competing in a game in which 78 year old men can trounce me. But it was great! If you wanna play sometime out here in Venice with me, just let me know! !